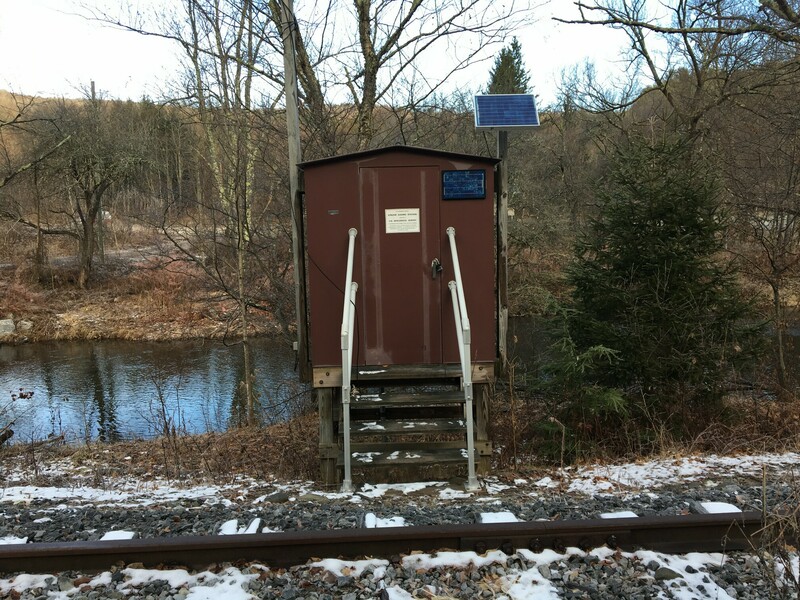 LOCATION.--Lat 42°09'03", long 74°36'05" referenced to North American Datum of 1983, Delaware County, NY, Hydrologic Unit 02040102, on left bank 60 ft upstream from private bridge, 0.7 mi upstream from mouth, 1.0 mi east of Arkville, and 2.4 mi east of Margaretville. REVISIONS HISTORY.--WDR NY-99-1: 1998 (P). GAGE.--Water-stage recorder and crest-stage gage. Datum of gage is 1,370.79 ft above NAVD of 1988. REMARKS.--Diurnal fluctuation at medium and low flow from unknown source upstream from station. EXTREMES FOR PERIOD OF RECORD.--Maximum discharge, 13,800 ft³/s, Aug. 28, 2011, gage height, 16.26 ft, outside gage height was 15.06 ft, from crest-stage gage, from rating curve extended above 1,900 ft³/s on basis of runoff comparison of peak flow from contracted-opening measurement at site 2.2 mi upstream; minimum discharge, 3.1 ft³/s, Sept. 24, Oct. 6, 2005; minimum gage height, 3.25 ft, Sept. 14, 24, 2005. EXTREMES OUTSIDE PERIOD OF RECORD.--Maximum discharge, 7,600 ft³/s, Jan. 19, 1996, on basis of contracted-opening measurement of peak flow at site 0.2 mi downstream, drainage area, 47.0 mi².